Discussion in 'The Garage' started by Camilo, Apr 13, 2018. Two weeks ago I purchased an XS650 that hadn't be run since 1988. Unseen. On eBay. For more money than I'm going to admit here. Every inch of her is covered in corrosion, the pipes were full of water, both tyres flat, all but one engine mount bolt had been removed, several screw heads stripped, every light cover is cracked or smashed. Brake lines, chain, and control cables either missing or disconnected. 37,000 miles on the clock. Most disappointingly the petcocks look like they've been living in a rainforest for the last three decades. With the exception of cleaning a chain one time I have never worked on a bike before. Propping up the Dutch economy with my order from Heiden Tuning. Likely the first of several. First step will be dismantling the engine, cleaning, checking for damage, then rebuilding, replacing all seals, piston rings, and spark plugs. If the engine is in good condition / can be repaired I will move on to stripping and repainting the frame. If I replace piston rings is it a good idea to hone the cylinders? Should I also reseat valves and replace the cam chain? Wulfbyte, LEGEND_10, yamageddon and 2 others like this. as a former Brit I know that no part of the UK is further than 80 miles to the coast. Alas that your newly purchased XS650 seems to have been parked somewhere between low and high tide marks. But I've seen photos of worse. And list members have re-built them into prize winners. Never mind the tyres being flat, as they have been on the bike since 1988 at least they are WAY past their "use by" date anyway. Just like the brake hoses and the rubber stuff generally. Those pretty wire wheels need their hubs and rims re-polished and re-spoking in stainless steel to look good as new. Yes, yes and yes on re-ring, hone, re-seat and replace and don't forget the valve stem seals. And your pile of new parts; those conical pleated carb pods do NOT play well with the stock carbs. Unipods or stock IMHO. Wulfbyte, peanut and Paul Sutton like this. Welcome to the Forum. I am fairly new here also and have received tremendous support from other forum members. I suggest that you down load the Service Manual for your model of XS. Some can be found on this forum in the Tech Section and others can also be found on sites such as "thexscafedotcom". The Shop Manual will work well in conjunction with your Haynes manual. I suggest doing a compression test on each cylinder to check how the engine stands today. Do this test then repeat with a bit of oil down the spark plug holes i.e. wet test. Post the results and get some opinions. If the head is definitely going to come off then check the cylinders for rust damage at the top - you could be lucky and find the engine is in good condition. I suggest not removing the pistons from the cylinders until you are sure as to what you want to do. When the pistons are removed this disturbs the piston rings and then the cylinders should ideally be re-honed before refitting the pistons. If just adding new rings then you must be confident that the piston clearance will accommodate the new rings after honing and also check the piston to ring clearances. In essence I am saying give the engine a good examination, get someone to make the piston clearance measurements and then decide how far you want to go on the engine. You may only need to lap the valves and change the timing chain and front guide. Bear-in-mind that new pistons/rings from cruzinimage will cost approximately £80 after import tax and a rebore will cost about the same. I meant to ask, in what area of the UK are you? There may be someone rebuilding an XS very close to you who can help you out and advise on places to buy parts from. I have had a lot of success with Yambits in the UK. Thanks fredintoon, haha yes it's certainly seen better days. Thanks for the advice, just found a machine shop not too far that can hone motorcycle engines, which is good news, might pay them a visit next week. Shame about the pods, figured it was a gamble, but they look so pretty! Great news about the wheels, was wondering if they could be saved, and there appear to be plenty of spokes available online. Thanks also Paul. I think I'm going to take the head off anyway, I already have replacement gaskets and studs and I am scared to turn over an engine that hasn't moved for 30 years. I don't really understand how to deal with the clearances. I've heard the cylinders can wear asymmetrically and that honing can restore it to symmetry, but this presumably makes the cylinders slightly wider? Will the machinist be able to tell me what sized rings I need? I just looked online and there are 0.25, 0.50, 0.75 and 1.00 oversize rings available. Wulfbyte and Jim like this. Those oversize rings are for the various oversize pistons. You don't fit them in a standard bore or on a standard size piston. However, it is possible to fit 1st oversize rings (.25) in a standard bore on standard pistons, but it requires filing the ring end gaps so they will fit in the bore. This is an old hotrodder's trick to get tight ring end gaps in a used bore. Wulfbyte and Paul Sutton like this. The compression test is done just using the kick started, the engine will not be running. 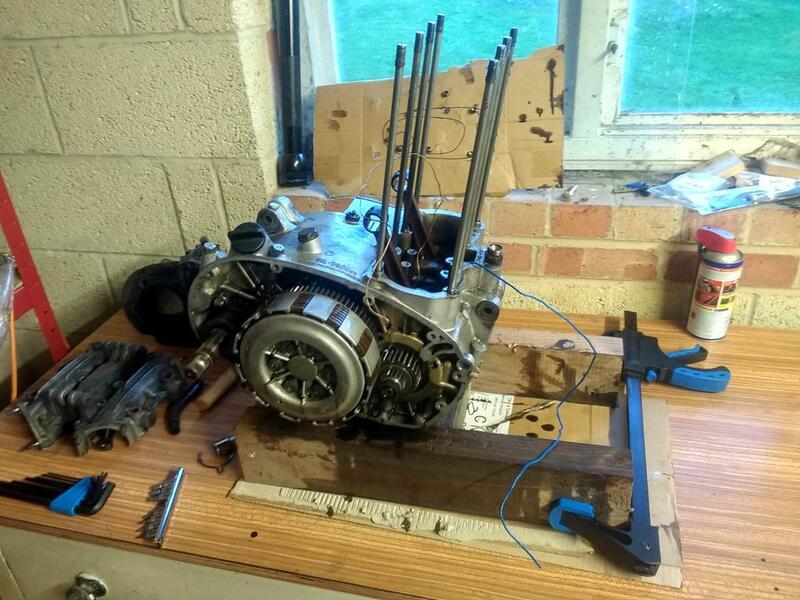 I noted that you have removed the engine but if you have mounted it in a bench top frame then you can still kick it over. The size of the ring matches the piston size i.e. if you have the original pistons (nominally 75mm diameter) then you use the standard rings. If the engine has been re-bored to its 1st Oversize then you need the 0.25 rings and the piston would have been replaced with one of 75.25mm diameter. When the head comes off you will probably see a 3 digit number stamped on the top of the piston. Mine have 963 which means the piston diameter at manufacture was 74.963mm. I had mine re-bored last year to the 2nd oversize which means the pistons are nominally 75.5mm in diameter and takes the 0.50 rings. At the bottom of each cylinder will be another 3 digit number to show how much the bore deviates from 75mm. Mine had 016 so the bore was 75.016mm. If you subtract the two diameters (Bore - Piston) you get the piston clearance at manufacture e.g. for me it was 75.016 - 74.963 = 0.053mm which is close to the mid point of the piston clearance specification (0.050 - 0.055mm). When you re-bore or change pistons you need to maintain the piston clearance specification, so you need to be sure that after honing and prior to fitting new standard rings you still lie within specification. Also, when you have a re-bore the engineer measures your new pistons and then re-bores and hones to ensure the specification is met. If the engineer measures your bores and pistons he may conclude that the bores can be re-honed and new standard rings fitted, assuming your engine has the original standard pistons. Edit: See the above note by 5twins regarding the old hotrodder's trick. Assembly Manual: Go down the page and you will see the assembly manual which can be downloaded and printed. It is a handy little manual giving loads of information about setting up an XS and where to position all the attachments and how tight to set the fasteners. Service Manual: Go down the page below the photos and you will find the XS650E manual. It has been divided into PDFs for each chapter which you can download and print off. General Information: The Home Page gives links to many useful articles. Under "Top Posts and Pages" you can search your engine and chassis number to find the Year and Model and hence what might be the best choice of manuals to cover your bike because there are regional variations. It may be that the XS650D manual supplement is also useful to you. peanut, TwoManyXS1Bs, ThatXS650Guy and 1 other person like this. Thanks everyone for the help so far. Over the weekend I started to disassemble the engine. Mostly went smoothly with a few exceptions. Someone had been in there before me a mangled most of the screw heads. Borrowed quality tools from a friend, which allowed them to be removed without further damage. The gudgeon pins were not finger tight like the manual suggested, even after heating the piston head! Took a bit of shimmying but got them out eventually. Alternator rotor was wedged on pretty tight, came off after applying the advice I read online - give it some beans. and lightly abuse it with a mallet. The rotor popped off accompanied by a loud crack that had me concerned I had sheared a bolt. Crank shaft has what appears to be some pitting on it, is this normal / ok? Found a local machine shop that specialises in repairing classic engines, hoping to get them to measure everything up and do any necessary work in the next few weeks. peanut, yamageddon, Paul Sutton and 1 other person like this. Yambits are very useful for parts in the UK . I bought my brake hose from Furore Products Ltd and as my 78 was an import with a single front disk I removed and bypassed the double brake disk hose fitting and ran a single hose from lever to caliper. gggGary, Camilo and Paul Sutton like this. Thank you for all the helpful information there Peanut, really appreciate it! Tachometer drive appears to be a bit bent and mangled at the end, is this normal/acceptable? I don't know if that damage to the gears is a big problem (perhaps could deteriorate or cause vibrations?) and if so whether it can be replaced. it looks like the bearing may have spun slightly . The gears have some minor galling which is pretty inevitable with these engines . The stock sump filter mesh fails and little bits of stray metal circulate around the oilways. Its probably the reason why the shared tach and oil pump drive shaft is damaged . If your tach gauge ever stops working it generally means your oil pump has failed also. The gearbox is universally recognised as one of the toughest and over-engineered out there and that light galling shouldn't be any problem unless there is other undisclosed damage. Looks like your clutch basket is in great condition has been replaced at some stage as there doesn't appear to be any indentation to the basket fingers which would be expected at that mileage. The replacement clutch pack needle bearing kit is a much improved bearing than the stock set so don't be tempted to reuse your original needle bearing race. Looks like you're making great progress . gggGary, MaxPete, Paul Sutton and 1 other person like this. Keep going Camilo - you’re doing well! You are going to want someone who KNOWS built up cranks to check yours. Not all that easy to find. Hint 2 strokes and old brit bikes are nearly all built up cranks. Think I found what caused the galling - oil filter has huge hole in it. I've put engine work on hold for the moment. Bit stuck trying to figure out how to clean the combustion chambers. Is it ok to use a stiff brass brush or will this cause damage? Nylon brush seems too soft to remove baked on carbon deposits. Started to work on the frame and electricals instead. I don't know what these are, anyone know? Wiring harness and instrument cluster off. I labelled all the wires as they came off but at the moment I am thinking of customising the bike, and building my own wiring loom. Forks seem to not be leaking but have a lot of corrosion on them, could they be repaired? Worst case I can get new fork inner tubes from Heiden Tuning but costs 145 Euros for the pair. Stopped there for the time being, don't have a big enough (17mm?) allen/hex key to remove the nut on top of the forks. Might order one and start working on the forks next weekend. You can use paint stripper to remove the carbon on the piston tops and combustion chambers. It will just melt it away but may require several applications. The combustion chambers are steel so can be scraped pretty aggressively (or wire wheeled) without fear of damage. But with the paint stripper, there's really no need for that. The softened carbon will almost wipe off. Once the carbon is removed, I finish the chambers off with some chrome cleaner on a rag. That will remove the discoloration left behind by the carbon. They'll look like new. And let me also mention that your carbon build-up isn't excessive. It looks about normal. Use the paint stripper again to remove all the old stuck on gaskets. Once again, several applications will be needed. The 1st application will only free up some areas or soften part way through the gasket. After gently scraping off the soft parts, re-apply. 2nd time is usually the charm, loosening what's left so just a gentle push with the scraper will remove it. With this technique, you'll do no damage to the gasket sealing surfaces. Those 2 electrical components - the rectangular rubber box is the turn signal self canceling unit. The round tin unit is the turn signal flasher. You'll need new fork tubes unless you know someplace that re-chromes them. Yours will tear the fork seals all up in short order. Thanks for the advice 5twins, made some progress with paint stripper and some wire wool - takes a long time! Rubber was old and hard, decided to cut them off. 18tpi hacksaw made short work of it, used some dish soap to lubricate the blade. Spokes weren't budging, even after leaving to soak in wd40. Cut the rear wheel spokes off with a hacksaw, gave in and bought a new cutting disk for the grinder and made short work of the front wheel. Knocked the RHS bearings out of the front hub fairly easily, just some patience. Found that the LHS bearings were a bit more stubborn. Generous application of heat resolved the issue. Used an engine mount bolt to knock it out, alternating left and right with gentle taps. Unfortunately they're not running smooth and will need replacing. 59Tebo, YamadudeXS650C and gggGary like this. I also found some German fuel tank restoration chemicals on ebay called "rostio" that I will give a try. 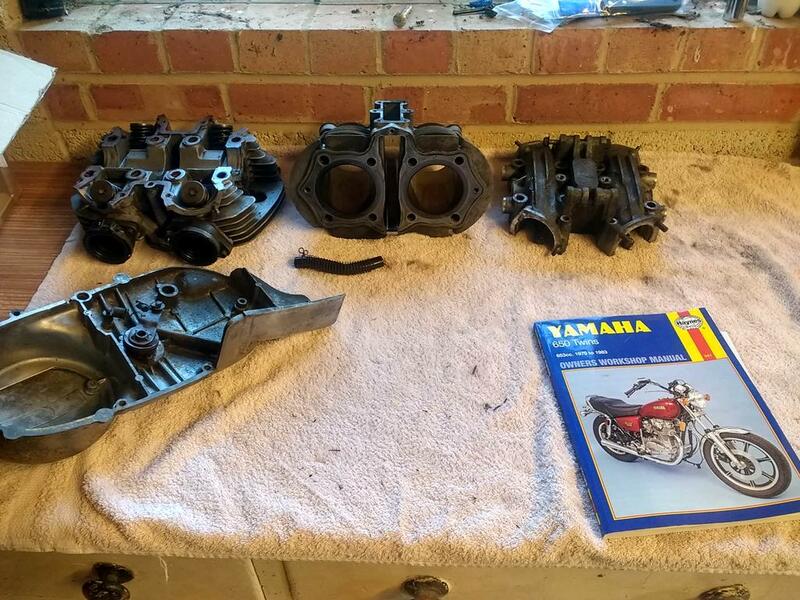 One fork is now dismantled, replacement parts ready to go, I'm just figuring out how to clean and polish polish the fork lower before reassembly. Bonus photo - I got sick of rummaging for tools in a disorganised toolbox and decided to start hanging them on the wall instead. I'm really enjoying being in the garage at the moment, here's to many more hours! 59Tebo, TwoManyXS1Bs, YamadudeXS650C and 2 others like this.